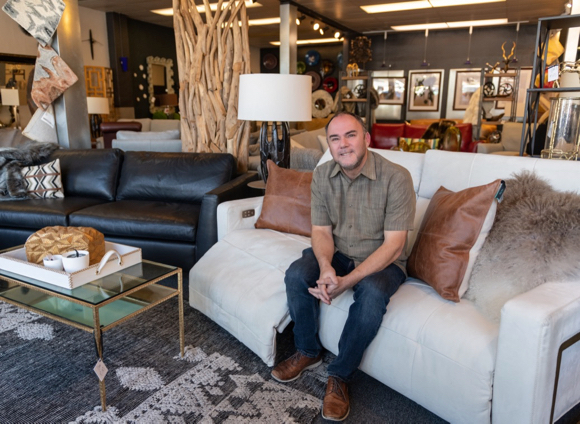 For Sean, who comes from a combined family of 16 (10 of whom his mother gave birth to), furniture was a business that he sort of fell into after playing soccer at DeAnza, a sport that he’d excelled in throughout his youth, enough so that he was named to the state soccer team. The Mulcahys not only sell new furniture, they do repairs and transform fabric furniture to leather and visa versa. They also take custom orders. They balance business and family life — they are the parents of three children, all who attend Menlo Park schools — by alternating days at the store. When their children were small, they had a playroom in the back, and as they get older, they hope they’ll have an interest in working at the store.